Xhosa is one of the official languages of South Africa. 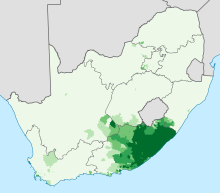 Xhosa is spoken by 7.6 million people, or about 18% of the South African population. Xhosa is written using a Latin alphabet. Henry Hare Dugmore helped translate the entire Bible in Xhosa language. Xhosa has ten vowels. Xhosa is well known for its set of three major clicks. ↑ Hammarström, Harald; Forkel, Robert; Haspelmath, Martin, eds. (2017). "Xhosa". Glottolog 3.0. Jena, Germany: Max Planck Institute for the Science of Human History. This page was last changed on 10 July 2018, at 13:18.